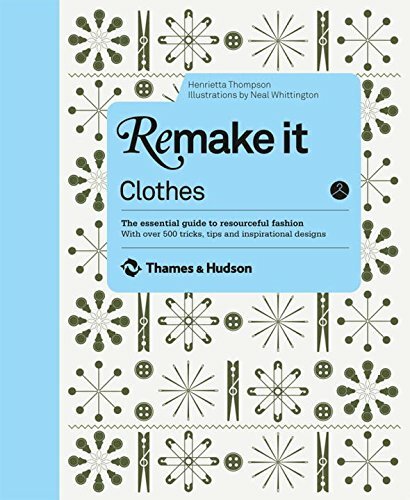 From its title, Remake it: Clothes, one might think this is a how-to book that strictly concerns itself with how to remake your wardrobe. You would be mistaken. This is no mere how-to book. Ms. Thompson provides the reader with an educational, historical, practical, and very ecologically friendly way to view one’s wardrobe within the framework of all the possibilities currently in use by fashion designers around the world in every area of wardrobe design, from baby clothes to handbags, jewelry to basic wardrobe items. Ms. Thompson offers us a plethora of designers who are reimagining how clothes and accessories are being made. She then takes the extra steps of showing us how to achieve these looks via diagrams and instructions. Think Simplicity patterns. In essence, Remake it: Clothes is much more than just a narrative or how-to. It’s an imaginative retelling of what is in your closet. Remake It: Clothes is for the historian, the future fashion designer, the student of design, and for all those who believe we are all capable of cleaning up our world by being smarter about how and what we recycle. Remake It: Clothes is a kind of survival guide providing ways of being environmentally smarter regarding fashion and more attuned to the possibilities that already exist and don’t require more consumerism. Like a fairy tale, the book proffers a perfectly ecologically conscious world of fashion, a vision of how things should be done.